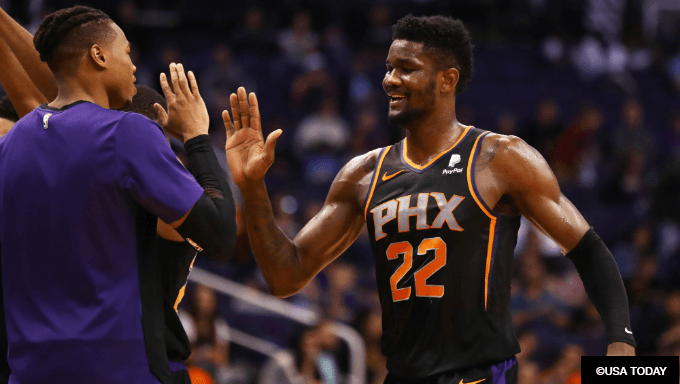 Can Deandre Ayton Still Win NBA Rookie of the Year Award? It’d be a shock if someone other than Luka Doncic took home this year’s Rookie of the Year. The No. 3 pick is putting up historic numbers and actually has the Mavericks contending for a playoff spot; they’re 17-19, six games better than they were a year ago through 36 games. But all rookies hit a wall at some point, and injuries happen. Betting on NBA Rookie of the Year can be tricky for fans of NBA betting. And with over half the season remaining, there’s an outside chance Doncic could lose his standing at the top rookie. That small chance has gotten a bit bigger over the last few weeks thanks to Suns center Deandre Ayton. The top pick in last year’s NBA Draft has been on a tear, averaging 22.3 points, 13.9 rebounds and almost a block and a steal over his last eight games. He’s shooting a remarkable 66.4 percent from the field in that span, and he’s helped Phoenix to a 5-5 record over their last 10 games. Doncic has joined elite company with his campaign, but so has Ayton. The last few weeks have been eye opening, but Ayton has really been good all year. In 38 games he’s averaging 17.0 points on 60.5 percent shooting and 10.9 rebounds in 31.3 minutes. And while defense has not been a strong suit of his in the slightest, he’s also averaging 0.9 blocks per game. And the only other rookies to average that many points, rebounds and blocks were Ralph Sampson, Hakeen Olajuwon, David Robinson, Shaquille O’Neal and Tim Duncan. For those keeping score at home, that’s 5 of 5 Hall of Famers, and 4 of 5 Rookies of the Year – and Olajuwon didn’t win it because of some guy named Michael Jordan. But past the rookie factor, Ayton’s scoring has him in impressive company. He’s been a monster around the rim, shooting an elite 72.3 percent on shots within 5 feet of the basket; Giannis Antetokounmpo leads the NBA in that category at 75.5 percent to put that in context. That’s allowed him to shoot 60.5 percent from the field, good for seventh in the league (and none of the six in front of him average more than the 12.4 attempts he takes per game). If he’s able to stay above 17 points and 60 percent, he’d be just the sixth player in NBA history to accomplish the feat. The others to do it? Kareem Abdul-Jabbar, Wilt Chamberlain, Artis Gilmore (four times), Dwight Howard (two times), Kevin McHale (two times) and Shaquille O’Neal (three times). Again, that’s a list comprised of all Hall of Famers, and none of them did it as rookies. The closest a rookie has gotten to the 17/60 threshold is Chris Webber (another Hall of Famer), who averaging 17.5 points on 55 percent shooting for the Warriors in 1994. So he’s a lock to win the award, right? Well, no. As we’ve written before, Doncic appears to be running away with it. But there’s no denying he’s got competition in Ayton. If you’re a believer, like, us, that the Phoenix center can maintain this pace, then he’s got solid value at +600 on 888Sport.